The Details on Student Loan Forgiveness. I am a millennial with current student debt. I knew it was an issue that concerned many of my friends & clients. Fast forward 5 years, we now have worked with over a hundred Gen X & Gen Y individuals and families. 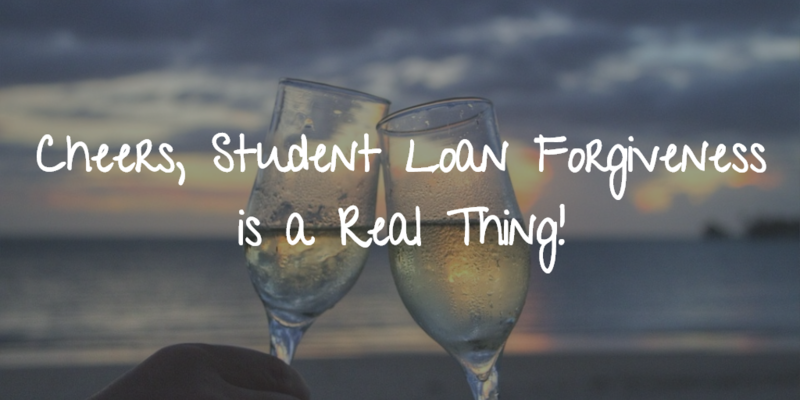 While each financial plan is custom built, one thing has remained consistent time and time again, student debt. We may not have the opportunity to work with everyone to build a custom plan; however, we wanted to share some ideas to help with having some of that debt (possibly) forgiven. That’s right, there is such thing as loan forgiveness! You need to work in the public sector (federal, state, local government, tribal organizations, AmeriCorps, and/or Peace Corps). This may include military service, law enforcement, public school teachers and admin, and public health careers. Keys to forgiveness: Must be federal direct loans (if your loans are not federal direct loans, consolidate your FEDERAL loans to DIRECT loans), make 120 on-time payments (10 years), majority of payments must be based on an income-driven plan (you can change to this plan if you are not using it currently), and work at least 30 hours per week. If your loans are already federal direct loans, complete the Employment Certification for Public Service Loan Forgiveness form to confirm your employment qualifies. This form verifies that you have completed the employment required for the program each year. Completing it requires you to fill in some parts and your employer to fill out the rest. While this is not a requirement, it is helpful for your servicer to track your eligibility. The best part is that any loans forgiven will NOT be counted as taxable income! Doctors: Details are in our recent blog. Nurses: If you work in the public sector you qualify for the above Public Service Loan Forgiveness program; however, you may also qualify for Federal Perkins Loan Cancellation and Discharge program and the Nurse Corps Loan Repayment program. Most states offer their own loan forgiveness programs as well. For example: Pennsylvania offers the Pennsylvania Primary Care Loan Repayment program. PA offers loan assistance for registered nurses who work full-time in designated Health Professional Shortage areas. Eligible candidates can receive up to $60,000, while part-time workers can receive up to $30,000. The service commitment is 2 years. Teachers: If you work in the public sector you qualify for the above Public Service Loan Forgiveness program; however, you may also qualify for Federal Teacher Cancellation for Perkins Loans program. There is also a Teacher Loan Forgiveness program and specific State and City Loan Forgiveness programs. Lawyers: If you work in the public sector you qualify for the above Public Service Loan Forgiveness program; however, you may also qualify for Department of Justice Attorney Student Loan Repayment program, The Herbert S. Garten Loan Repayment Assistance program, and the John R. Justice Student Loan Repayment program. Each state also offers a Loan Repayment Assistance Program (LRAPs). For example: Pennsylvania offers the Pennsylvania Bar Foundation Loan assistance Program. The program is meant to help lawyers understand their student debt and make it more manageable. Your salary cannot be above $66,000, and the award varies based on the number of candidates and available funding. Hopefully you are not paying these darn loans back for the next 20-25 years but unfortunately, some of us will. The good news is, your remaining loans may be forgiven. Your payments need to be based on an Income-Based Repayment plan. There are a few different types: Income-Based Repayment (IBR), Pay as You Earn (PAYE), Revised Pay as You Earn (REPAYE) and Income- Contingent Repayment (ICR). This is only good for FEDERAL loans, not private loans! You will pay A LOT more in interest by spreading your payments out over 20-25 years and the amount that is forgiven WILL count towards your taxable income. This strategy does require a little bit more planning due to those items. If you can afford a standard repayment plan, that usually makes more sense. The major issue I have seen thus far is that friends and clients have been paying their loans back for years already; however, they were not federal direct loans. Guess what happens, all those payments don’t count towards your forgiveness! Another issue is that we don’t sign up for an income-based repayment plan; this usually leads to a much higher payment (but shorter payback period and less interest in the long run). A MAJORITY of your payments have to be paid based on an income-based repayment plan to qualify for most forgiveness programs. If you may qualify for any of these programs, a recent study showed that 1 out of 4 people actually do qualify; you should contact your loan provider. Ask them if your loans are federal direct? If not, think about consolidating your federal loans to direct loans. Also, ask if your payment schedule is based on an income-based repayment plan? If not, ask them what this may do to your current payment. Questions and comments can always be emailed to us. That would be a great time to ask any specifics on the items above or any other questions you have.